Even though interest in precious metals has fallen over the past few years, investment demand is still the largest growth sector in the silver market. Yes, it may be hard to believe, but physical silver investment has grown the most since the 2008 financial crisis compared to the other sectors. 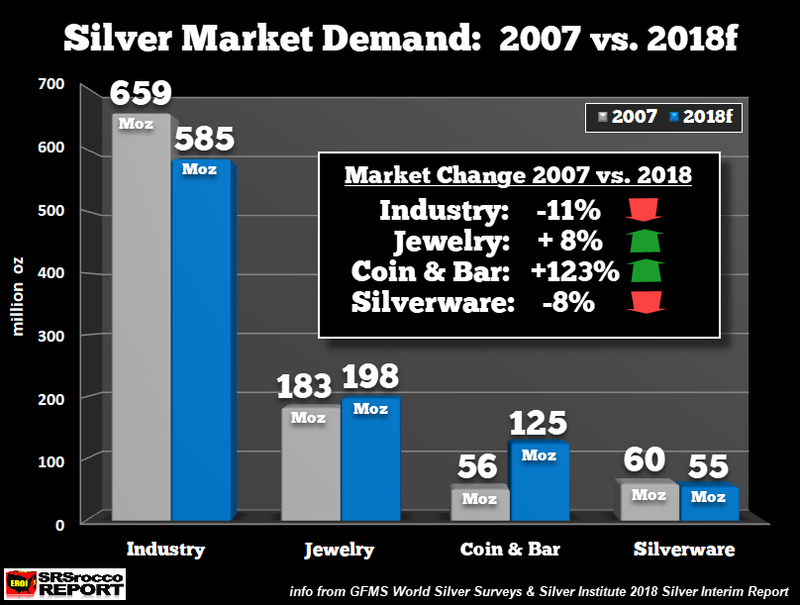 And while industrial users consume the highest amount of silver in the overall market annually, its total demand has fallen over the past decade. Furthermore, a new study shows that global PV solar demand will decline by 40% over the next five years. But, I will get to that later in the article. However, I wanted to focus on physical silver investment demand because the alternative media community seems to have this idea that SILVER IS DEAD… IT’S NOT. While it’s true that investment demand has declined significantly from the peak a few years back, it is still much higher than what it was before the 2008 financial crisis. Now, according to the Silver Institute’s Interim Report, total coin and bar demand will fall to 125 Moz in 2018, down from 142 Moz during the prior year. So, even though physical silver investment demand is down more than half of what it was at its peak in 2015, it is significantly higher than what it was in 2007, before all hell broke loose in the financial system and economy. 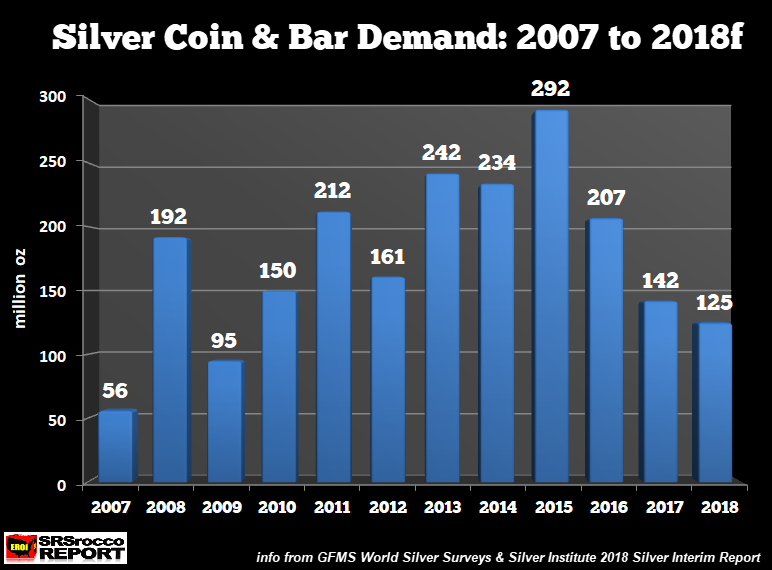 Looking at the data from prior World Silver Surveys (found at the Silver Institute), coin and bar demand ranged from 50-60 Moz during 2000-2007. However, things got really interesting in the silver market when the priced jumped to $20 in 2008 on the back of a disintegrating banking and housing market. Silver coin and bar demand more than tripled in 2008 to 192 Moz. But, in 2017 and 2018, the ongoing low prices saw global silver coin and bar demand fall to lower levels as investors focused on the more volatile broader markets, Bitcoin and the Cryptos. Nonetheless, I believe life will return back into the precious metals in 2019 as FEAR ENTERS into the market. Analysts who continue to brag about rising industrial silver demand don’t seem to pay attention to the figures. Industrial silver demand peaked in 2011 at 661 Moz and is forecasted to fall another 2% this year to 585 Moz down from 596 Moz in 2017. I have stated over and over again, that industrial silver demand is not the primary driver of price. Why? In 2012, when the silver price was higher at $31 industrial silver demand was less at 600 Moz compared to 634 Moz in 2019 when the price was only $20. 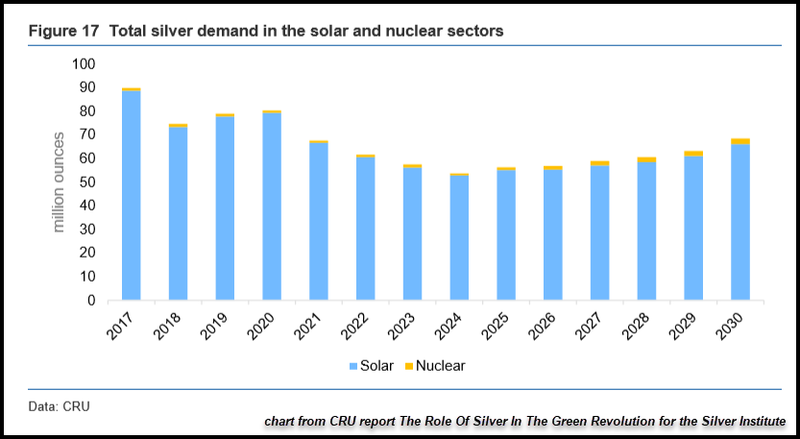 Not only is PV Solar silver demand to fall considerably this year compared to the nearly 90 Moz in 2017, but the CRU Report also forecasts that it will continue to decline to approximately 50 Moz by 2024. I gather we can now dismiss all the supposed notions of massive increases of Solar PV silver consumption in China and throughout the world. Actually, I believe Solar PV installations will begin to decline considerably as the market realizes it’s too expensive and its very low EROI – Energy Returned On Investment will not provide the Green Energy future as planned. One more thing, the more PV Solar Plants that are added to the grid, the more balancing power that needs to be added to offset the huge drop-off at night when the sun isn’t shining. Very few people realize the huge problems associated with adding Solar to the Electric Grid. In my ongoing research, I have found out that supply and demand forces are not good primary indicators of the silver price. Part of the reason that supply and demand fundamentals play less of a role with silver has to do with the 2.5+ billion oz of custodian silver metal stored in vaults across the world. Moreover, as I stated, the highest physical silver coin and bar demand of 292 Moz in 2015 was due to 50% REDUCED PRICE SALE compared to 2012. So, there are very complicated factors driving the silver market. My newest analysis of the Day Trading Markets has brought a new understanding of what GUIDES THE MARKET PRICE of stocks, commodities, metals, etc. However, the COST OF PRODUCTION is the overriding factor that provides a FLOOR in the price of most things. I am not saying this is 100%, but production costs are the leading indicators of price when all things are equal. And by that I mean, when the market is balanced, the cost of production is the normally the floor price upon which supply and demand forces react. Let me give you an example. If we look at the financial statements of most companies, they are all making a small percentage of profits once we account for ALL COSTS. So, if a company like Caterpillar is manufacturing and selling Earth Moving Machines for the market and they are making about a 5% profit (give or take), then the total cost of that machine they sell becomes the 95% of the market price. It’s really that simple. Now, of course, Caterpillar isn’t going to manufacture and sell ten times more machines in a given year than the market demands as that could depress prices. Furthermore, their financial constraints (small annual profits) KEEPS them from manufacturing too many machines because they just don’t have the extra money or available low-cost credit to do so. So, the market is kind of self-regulating when we consider supply and demand forces. Once we understand this self-regulating market, the most significant factor that is impacting market prices… is the TOTAL COST OF PRODUCTION. Please know that I am talking about a “Typical balanced market,” not some poor slob on the desert who would exchange his gold watch for a gallon of water. That is not a typical market. 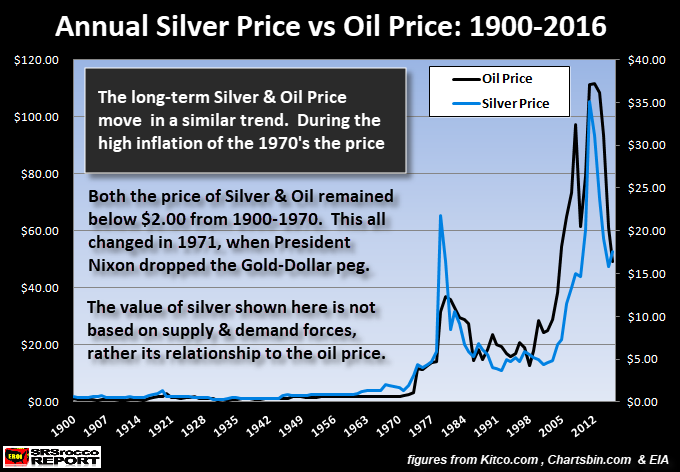 As we can see, the silver price has trended nicely along with the oil price since 1900. Silver spiked higher in the 1970s versus oil because there was much higher “consumer price inflation” while the 2000s experienced a great deal more “asset price inflation” (stocks, bonds, and real estate). Also, physical silver demand had more of an impact on silver price in the 1970s while the paper markets have been the leading driver for at least the past two decades. Here we can see that for the most part, Pan American’s total mining costs were slightly below or above the market price. 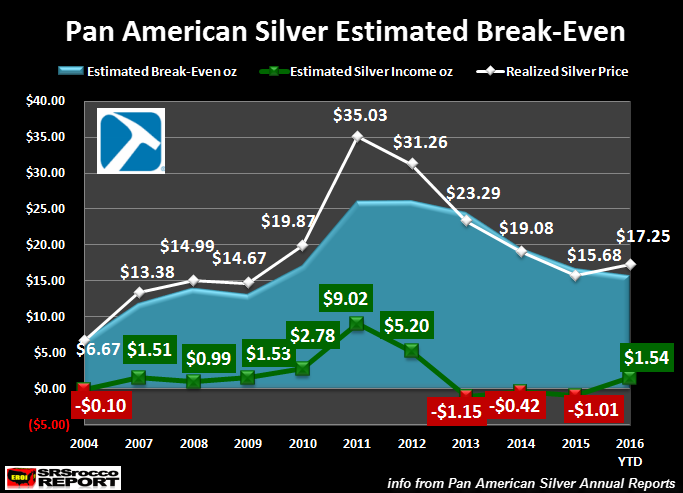 Only during the highly speculative silver years of 2011 and 2012 did Pan American Silver enjoy much higher profits. In my most recent update, Pan American Silver’s AISC – All-In Sustaining Cost in Q3 2018 was $13.73, not much lower than the current market price of $14.15. So, with all the global supply and demand forces over the past century, I find it quite amazing that the silver price has trended up and down with the oil price. Why? Because the oil price is the main driver of the economy and it sets the INFLATION RATE and PRODUCTION COSTS of most things. I don’t care if the market or individuals create the demand for silver and the miners produce the supply… they cannot determine the PRODUCTION COST… that is based on the thermodynamics of a highly complex system. Yes, it is true that if no one on the planet wanted silver, then common sense would dictate that its value would be ZERO. However, if people desire goods and services, they are going to have to pay the price to cover the COST OF PRODUCTION. It is that simple. I will be writing more articles and publishing new videos on what is and what will be the NEW DRIVER of the silver price in the future. I get a lot of questions from people who ask me that if I believe the oil price will fall, then how can I see much higher silver prices in the future. WELL, THERE LIES THE TRILLION DOLLAR QUESTION. But, to put it quite simply, the massive $247 trillion in global debt has provided a temporary illusion of high STOCK, BOND, and REAL ESTATE asset prices. Basically, the debt has blown up these asset values. However, GOLD & SILVER are not being propped up by debt. When the debt implodes, most asset prices are going to deflate into the cesspool. And with falling U.S. and global oil production, it will make a bad situation worse. Growing global oil production has allowed the debt to increase, but this will head the other way when the oil supply turns south. When investors watch as their assets continue to go from BAD, to WORSE to AWFUL, they will move into gold and silver to protect wealth. This will be the time when precious metals SUPPLY & DEMAND forces finally kick in a big way. Lastly, the next market phase we will enter into is WEALTH PRESERVATION. So, when the investors become reacquainted with precious metals during this phase, we will no longer have to worry about whether or not SILVER IS DEAD.